While Acer was busy showing off a smattering of large-screen Windows devices in New York Friday, the 8.1-inch Acer Iconia W3-810-1600 was briefly available for perusal in the digital realm. Why does that matter? Because all Windows 8 tablets released thus far have packed 10-inch or larger displays, as Microsoft's operating system was engineered before diminutive tablets like the Nexus 7 and Kindle Fire became all the rage. 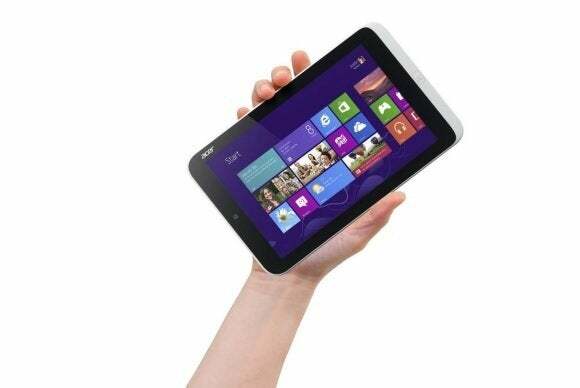 As far as Acer's Iconia W3 goes, rumors of the 8-inch slate first surfaced in late April. It's still yet to make an official debut, but the Amazon page revealed that the tablet packs a dual-core Atom processor, along with numerous other technical details you can see in the image to the right. A few key details stand out about the Iconia W3. First of all, it definitely takes advantage of the reduced screen resolution spec, with a Nexus 7-matching 1280-by-800 display. Second, the inclusion of an x86 processor means the 1.1-pound slate will run the full-blown version of Windows 8, rather than the neutered Windows RT operating system. We still have some reservations about using the full-blown version of Windows 8 on such a small screen, but hey, 7-inch tablets are what people are buying. Microsoft needs to be there to be competitive. The most notable part of the Acer Iconia W3's Amazon listing, however, is the price. Small screen Windows tablets have had one major question hovering over their heads since the concept was first floated: How low can they go? The rear of the Acer Iconia W3. Android tablets hit such rock-bottom prices because Google doesn't force manufacturers to pay a license fee for the OS, whereas OEMs need to pay Microsoft for each and every Windows tablet built. Microsoft is rumored to be offering Windows and Offices at highly reduced costs to spur small slate development, however. Amazon's early leak of the Acer tablet gives us an unofficial price barometer. The e-tailer had the Iconia W3 listed at a $379.99 That's more than a dirt-cheap Android tablet, but far from outrageous—basically, it offers the full Windows 8 experience for just $50 more than the cost of the iPad mini. Not too shabby. We'll undoubtedly hear more about the Acer Iconia W3—and presumably, a multitude of other small-screen Windows slates—in the weeks and months to come.